According to the American Heart Association, more than twelve million people have sleep apnea. Many don’t even realize it. When you sleep your body relaxes. That includes your tongue. In some cases, this causes the tongue to impinge on the breathing passage, causing the soft tissues to vibrate as you breathe, producing a snoring sound. passage, causing oxygen deprivation. This is known as obstructive sleep apnea. In this case your body senses that you’re not getting enough oxygen and wakes you to protect you from asphyxiation. These recurring cycles of oxygen deprivation and waking can occur as often as a hundred times a night, and you may not even been aware of them. But this is what causes the medical complications of sleep apnea. Snoring may not be a problem for the affected individual, but can be considered a serious problem for others who sleep in the same room. Fatigue is a problem. You have slept all night, but haven’t gotten enough rest, so you may have difficulty concentrating and tend to fall asleep during the day. High blood pressure. When the oxygen content of your blood drops from breathing obstruction, it causes an increase in blood pressure. Other heart problems. Obstructive sleep apnea increases the risk of both heart attack and stroke. It also leads to irregular heartbeat and because of this can even lead to sudden death. If you believe you may be suffering from sleep apnea, this is important enough to your well-being to have the problem checked out thoroughly. If you suspect you have sleep apnea, Dr. Arnold recommends starting by getting a sleep study. This will give him a much better indication of what is going on with your breathing during the sleep cycle. If there is no obstruction involved and your problem is simply snoring, a sleep study probably won’t be necessary. But if there is any obstructive component, it’s best to have that sleep study. 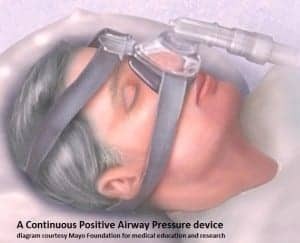 sleep apnea with Continuous Positive Airway Pressure, which is delivered by a CPAP machine, shown at the right. While this machine is effective, it is restrictive, noisy, and uncomfortable to wear. There is a simpler way. 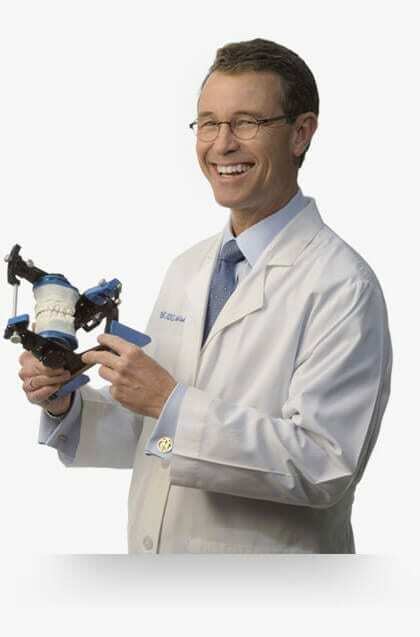 Most mild to moderate sleep apnea can be treated very successfully by wearing a simple mandibular advancement appliance. This snaps comfortably onto your teeth like a sports mouthguard. As you close your mouth, it gently pushes your lower jaw forward, which keeps the soft tissue of the soft palate from closing off your airway. Since it is made to fit your teeth and to temporarily alter the way your teeth come together at night, it is best to have this made by a dentist. This mandibular advancement appliance is much less expensive than a CPAP machine, and is much more comfortable. As shown in this diagram, it gently moves the jaw forward, which opens your breathing passage, enabling you to breath normally through the night. If you have sleep apnea and have been prescribed a CPAP machine, you will likely find this a much more pleasant solution. If you suspect you have sleep apnea, or if you or your partner has a snoring problem, you may call our office to schedule an appointment or, if you prefer, you may click here to request an appointment online.